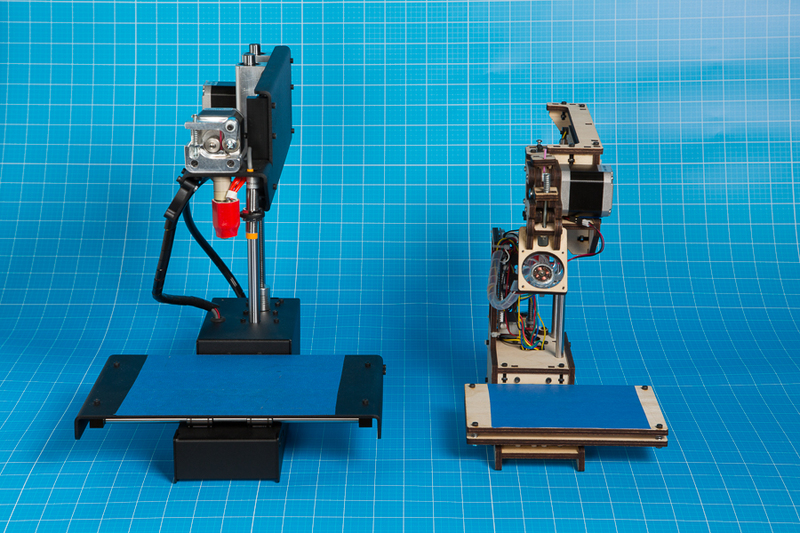 Printrbot has been on my radar since the release of the low-cost and high-value Simple. Since then, Printrbot has been busy. They recently released the all-new metal Printrbot Simple, which is faster, larger, more accurate and even quieter than the last one. This printer has been upgraded in every way. The new Simple may have the same look, but under the hood, there were upgrades: they got rid of the wood, bed leveling screws, string and small z-axis rods and added metal, an auto-leveling probe, rubber toothed belts, and 12mm z-axis rods. The hardware upgrades make the Simple a completely new machine. The aluminum body and thicker z-axis rods make the z-movements more rigid, allowing the z-height to be increased from four to six inches. Along with the z-axis height, the x and y axes have also grown from four to six inches, increasing the build volume from 64 to 216 cubic inches (a 238% increase). The new rubber toothed belts contribute to higher precision prints, which helps overall quality and print consistency. I had good results when printing with resolutions between .3mm and .1mm. The feature that can save users the most time is probably the auto-leveling probe. This does a pretty good job of setting the nozzle height every time you use it, even if the printer has been jostled around between prints. On top of these improvements, the new Simple comes with an aluminum extruder and an upgraded hot end, which seems to be slightly more precise than the previous hot ends. 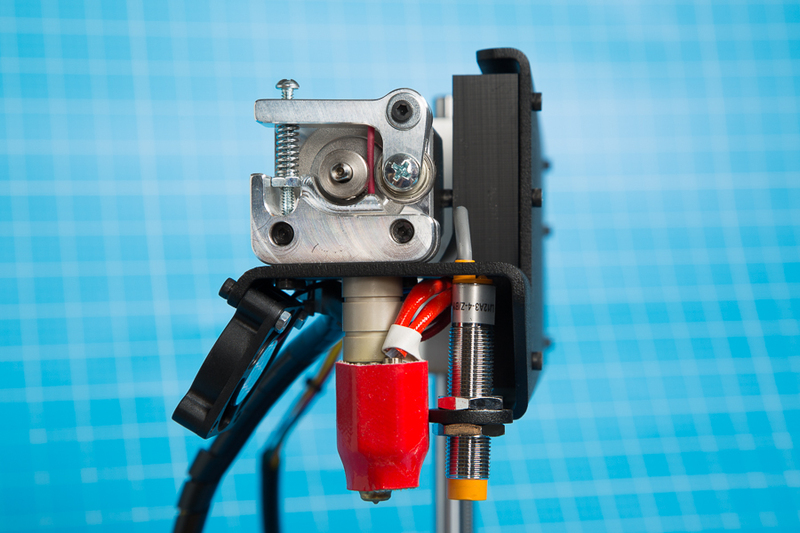 Here you can see the aluminum extruder, upgraded hot end, and auto-leveling probe. The only thing I don’t love about this printer is that it is significantly heavier than the wooden Simple, which makes it a little less portable. I’m definitely impressed by this printer and would recommend it to people who want to get into 3D printing or upgrade from an original Simple. It’s fast, precise, and not a huge investment. 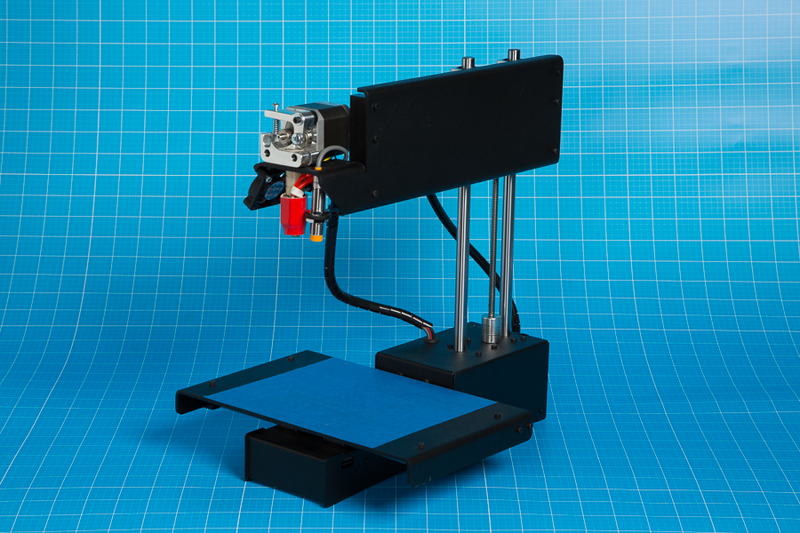 Buy your metal Printrbot Simple in the Maker Shed today! A kit version is also available.